The story behind DARNA is so simple and spontaneous. Three passionate bloggers, food photographers and friends came together and met in one place they called DARNA “Our home” though in reality they live thousands of miles apart. Their passion to preserve Middle Eastern heritage, to put a modern twist on it and to present its beauty and richness to the world was truly the drive behind the formation of DARNA. Darna aims to bring its readers a spoonful of Middle Eastern Cuisine, crafts and stories woven in one package to give you the best of the Middle East; A true taste of thousands of years of tradition and heritage. 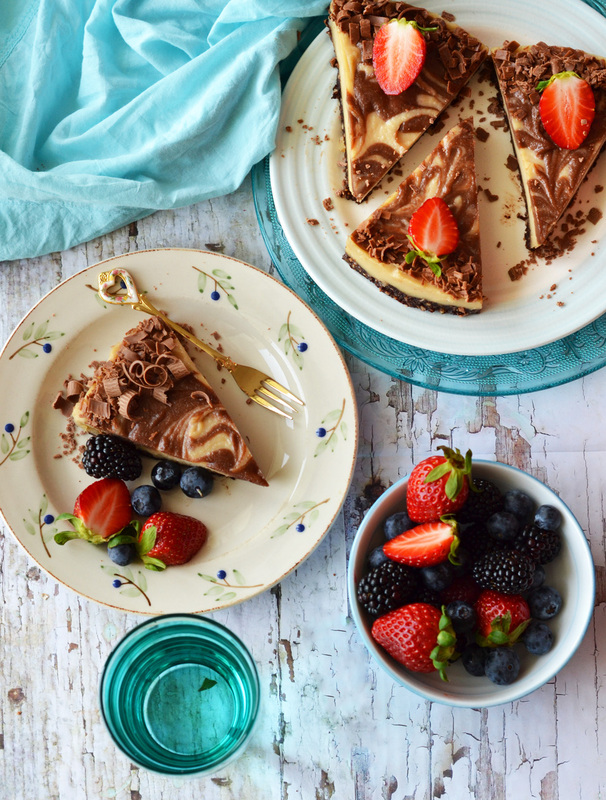 Have you ever offered your kids a slice of cheesecake and regretted the decision almost instantly because the sugar rush sent them bouncing off the walls? I know I have! There has to be a way to enjoy a slice of cheesecake without all the sugar and empty calories! For my Philips #30DaysofHomemade challenge, I was determined to find one! I have experimented with sneaky desserts before and have quite a few family favorites in my arsenal but a raw cheesecake was not one of them. 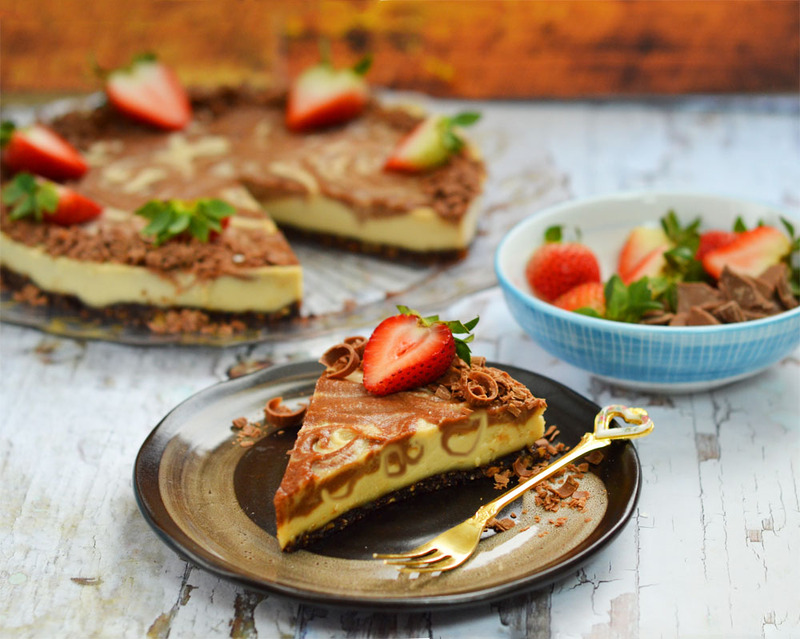 I have been intrigued by the idea of a raw cheesecake for quite some time.The idea is to prepare a dessert in which all the ingredients are raw, unprocessed ,keeping the vitamins and minerals in the food intact.You get to enjoy a dessert that is not loaded with empty calories, a dessert that is full of nutrients (you don’t see the words dessert and nutritious in one sentence quite often!). But will it taste good? or will it taste too “healthy”? When this challenge came around I knew it was my chance to experiment with the idea. Raw cheesecakes replace the regular cracker base with a nut and date combo. The nuts provide the rich earthy notes you usually get from the crackers and butter while the dates adds sweetness and act as a cohesive agent to hold everything together.For my cheesecake I chose hazelnuts because they work beautifully with chocolate. The filling in raw cheesecakes is primarily cashew nuts that are pulverized into a cream like consistency. They act as a replacement for the cheese in the cheesecake. Now I know that the last sentence must have raised quite a few eyebrows. That was my exact reaction when I first researched raw cheesecakes. Cashews? instead of cheese? But after trying it a number of times I am here to tell you that when you soak cashews for a few hours then cream them in a food processor, they transform into a velvety,luscious cream.My kids loved the filling so much that they ate it by the spoonful! The second concern that I know many of you will have is that cashews have a reputation for being full of fat.Is it really a healthier choice to replace cheese with raw cashews? Ok, now that we have answered all the concerns, how does the end product taste like? 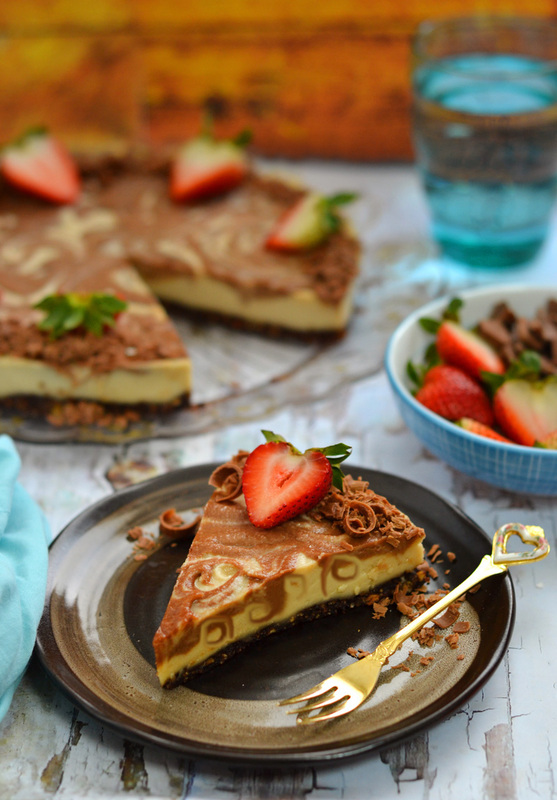 If you have never tried a raw cheesecake, believe me you are in for a treat! Velvety smooth filling that melts in your mouth and a nutty crust that provides a beautiful contrast in terms of texture. As you can see from the pictures the cheesecake sets perfectly and you can cut it and serve it in slices easily.So it also checks the presentation box. Place nuts and dates in your Food Processor and pulse to chop until they are to your desired fineness (for a fine crust, process it longer; or for a chunkier crust, process it less). Place your crust mixture in a 9” springform pan (if you don’t have a springform pan, use a regular pan lined with cling film), and press firmly. You need to make sure that the edges are well packed and that the base is relatively even throughout. Place all filling ingredients (except the cocoa powder) in the most powerful blender that you have and blend on high until very smooth (this make take a couple of minutes and you may need to stop and scrape the sides, so be patient). Pour about 2/3 of the mixture out onto the crust and smooth with a spatula. Add the cocoa powder to the remaining filling and blend on high until smooth. Dollop the chocolate mix onto the first layer of filling. To serve, remove from freezer 30 minutes before eating. There are two key points for the success of this raw cheesecake: you need to soak the cashews for more than 5 hours to ensure that when you pulverize them, they will become creamy. You also need to use a powerful blender and you need patience. The cashews will give you the melt in your mouth cheese feeling only if they are completely smooth. The coconut oil is solid at room temperature that is why it is included in the recipe, to help the filling set, you can’t replace it. You need to drain the cashews for 10- 15 minutes after soaking because if you don’t the extra water will make your filling runny and it won’t set. You can play with the flavors of this cheese cake. 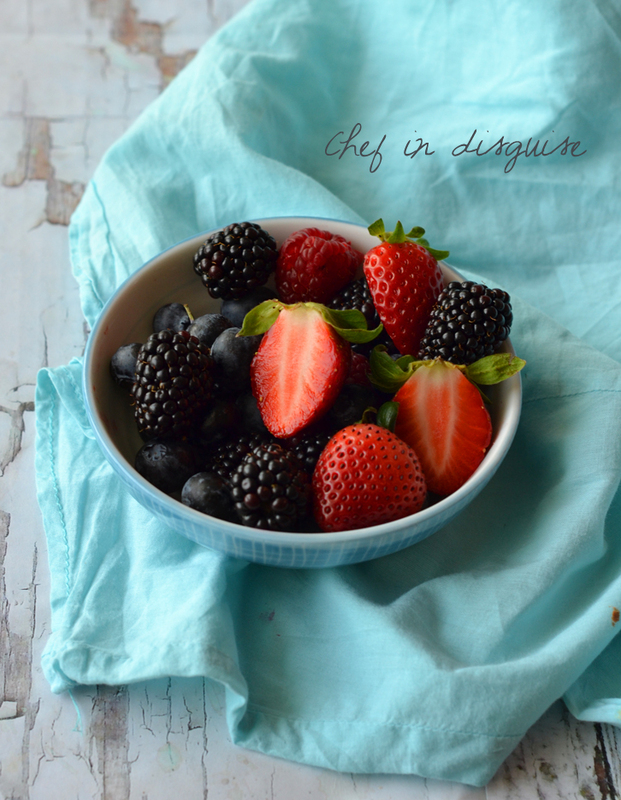 Instead of the coco powder you can add berries or caramel sauce or any other flavoring agent that you like. هل سبق لكم وأن قدمتم قطعة من التشيزكيك إلى أطفالكم وشعرتم بالندم مباشرة بعدها لأنهم أصبحوا مفرطي النشاط بفعل كمية السكر الكبيرة؟ لقد مررت بهذه التجربة شخصياً، وكنت أفكر دوماً بأنه لا بد من وجود طريقة للتمتع بالتشيزكيك دون استهلاك هذه الكمية الكبيرة من السكر والسعرات الحرارية، ولذلك كنت مصرّةً على إيجاد طريقة أثناء مشاركتي في #تحدي_الثلاثون_يوماً للطبخ المنزلي مع فيليبس، وقد وجدتها بالفعل. في هذه الوصفة لإعداد التشيزكيك سرٌّ غير متوقع، فكل المكونات المستخدمة غير مطهوة للحفاظ على الفيتامينات والأملاح المعدنية فيها. لا تتسرعوا في الحكم، إن لم تسبق لكم تجربة التشيزكيك بهذه الطريقة فبانتظاركم مفاجأة سارّة ولذيذة. ضعي الجوز والتمر في جهاز تحضير الطعام ، واطحنيهما معاً حسب الرغبة (لقاعدة ناعمة اطحنيهما لمدة أطول، أما العجينة الخشنة المقرمشة فتتطلب الطحن لمدة أقل). اختبري تماسك العجين بالضغط على كمية منه في يدك، فإن كان متماسكاً تكونين على الطريق الصحيح، أما إن تفتت بسهولة يمكنك إضافة المزيد من التمر إليه. مددي العجين في صينية خَبز ذات قاعدة قابلة للفك والتركيب بقياس 9 إنش (يمكن أيضاً استخدام صينية عادية بعد تغطية قاعدتها بورق التغليف البلاستيكي)، وقومي بالضغط عليها بإحكام. تأكدي من أن الحواف متماسكة وأن المزيج موزع بشكل متساوٍ. ذوبي زيت جوز الهند مع العسل في مقلاة صغيرة على نارٍ هادئة. ضعي مكونات الحشوة (ما عدا مسحوق الكاكاو) في الخلاط وامزجيها جيداً على سرعة عالية (قد يستغرق الأمر بضعة دقائق ومن الممكن أن تحتاجي إلى كشط جوانب دورق الخلاط، لذا كوني صبورة). اسكبي ثلثي مزيج الحشوة فوق العجينة ووزعيه بتساوٍ باستخدام ملعقة الطهي. أضيفي الكاكاو إلى ما تبقى من الحشوة وامزجيها جيداً على سرعة عالية، واسكبيها فوق المزيج في الصينية. استخدمي سيخاً خشبياً لمزج الطبقة المحتوية على الكاكاو مع الحشوة بشكل لولبي. ضعي الصينية في الفريزر حتى تتماسك تحتاج من 2-3 ساعات. أخرجي التشيزكيك من الفريزر قبل ثلاثين دقيقة من موعد التقديم. Posted in Cheesecake, Chocolate, vegan, Vegetarian and tagged #30DaysofHomemade, cashew, Chocolate, chocolate swirl cheesecake, dates, hazelnuts, healthy desserts, raw cheesecake, raw desserts, recipe, sneaky desserts, كاشو, vegan desserts, vegetarian desserts, تمر, تشيز كيك صحي, حلويات بارده, حلويات صحيه. Bookmark the permalink. MY STARS IN HEAVEN!!!!! I literally almost FELL FROM MY CHAIR here… oh, Sawsan, that is absolutely amazing, and lovely, and wonderful, and I am soooo thrilled for you! Of course I will be following all your new adventures! congratulations, and now that I am a little recovered, I shall indulge in this beautiful recipe…. 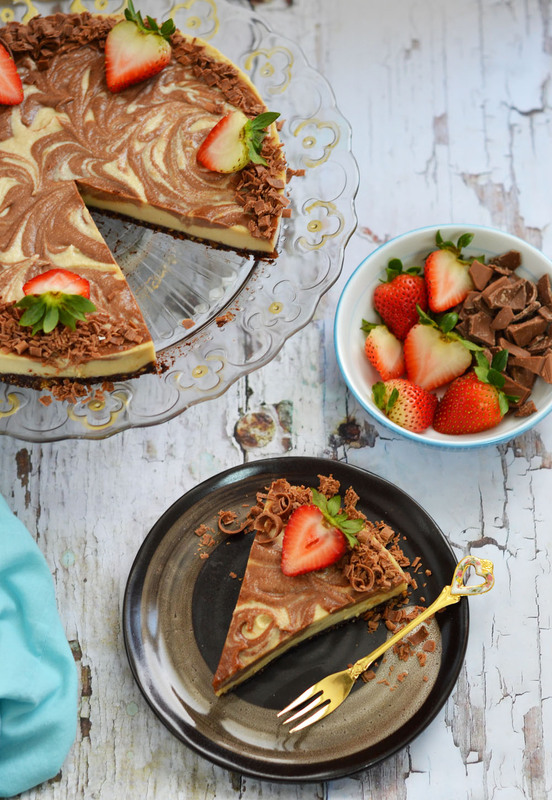 Your cheesecake looks absolutely perfect! Darna looks like a great magazine. Oh wow, congratulations on Darna, sounds like a wonderful project. Love the story behind it too. Also today’s recipe looks so beautiful and I’m sure it tastes just as good! Thank God for Sally’s comments!! Since I eat neither cake nor dessert I oft do not look at posts involving those because of lack of time. But I luckily just read the comments and . . . Sawsan, this is wonderful and will be both interesting and informative. So happy for you and your teammates and am immediately going back to learn about the ‘red’ version of one of my favourite Middle Eastern dishes 🙂 ! Good luck: not that you need it!!! 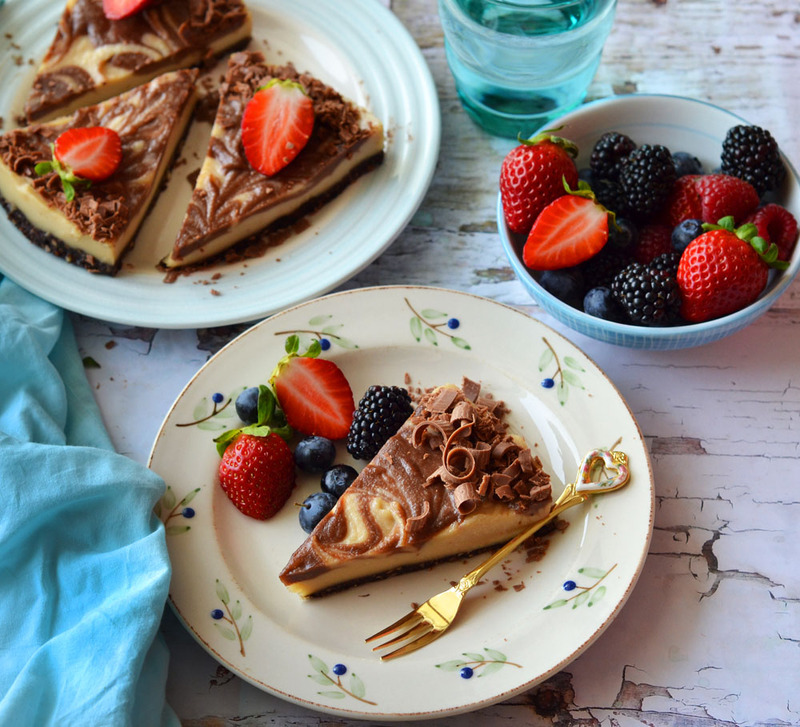 What a wonderful cheesecake and gorgeous recipe Sawsan! Big congrats on your beautiful project with your dear friends! The magazine is exquisite and so warm and welcoming too! Sharing the love for you today! Congratulations on the eZine!!!! That is amazing! I can’t wait to flip through. I’m sure the photos are stunning and I have no doubt some of the recipes will make it into our kitchen! Congratulations Sawsan! That looks beautiful I love how the swirls go down in to the cheesecake itself so that you can see them when you cut a slice. Will have to add this one to the “must try” pile! Congratulations! What a great accomplishment, I wish you and the magazine much success. I have made quite a few things with nuts that I never thought I’d make and one was raw cheese so taking it to the next level in a cheesecake is not far fetched for me. I was happy to read all of the benefits of the cashews, I have avoided them in the past thinking they were not as healthy. Where can I get the magazine. Sorry, Sawsan. I thought the magazine might be available in print. It is beautiful. I would definitely subscribe. Tried many of your recipes, and all turned out great. I live near Chicago, IL. in an area that is largely arabic, but I am Polish. Sawsan SO excited for you. Darna looks beautiful. The photography, the recipes, everything! CONGRATULATIONS! I will certainly give this a try. Not all of us are low fat. a replacement for the dates, but fat is a good thing! 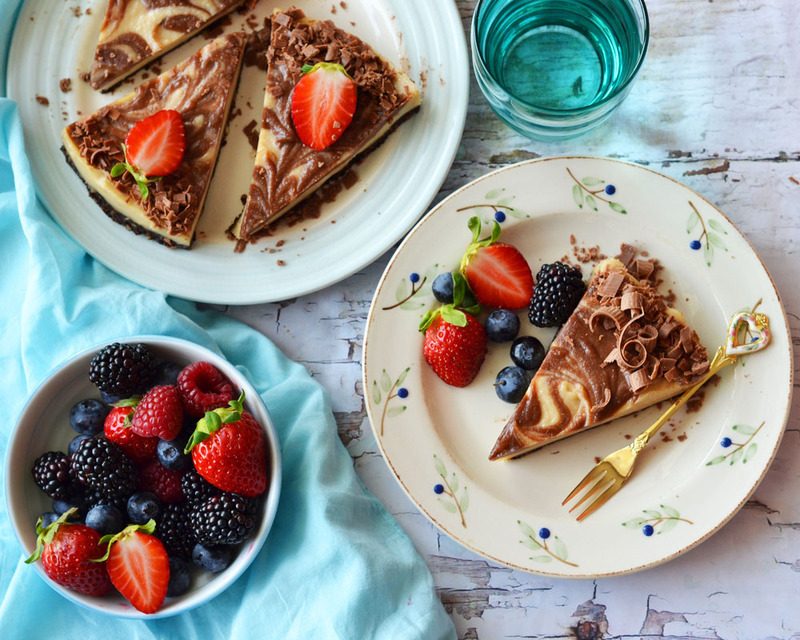 Yet anthother good trail of mine is your choclate swirl recipe.I made it when my cousin from India came here.I added honey and cherry as topping just to make some difference in this cheesecake.